Since pdfToolbox 8.2 is offering 14 new profiles for validating and fixing documents in line with the Ghent PDF Workgroup Specification 2015. 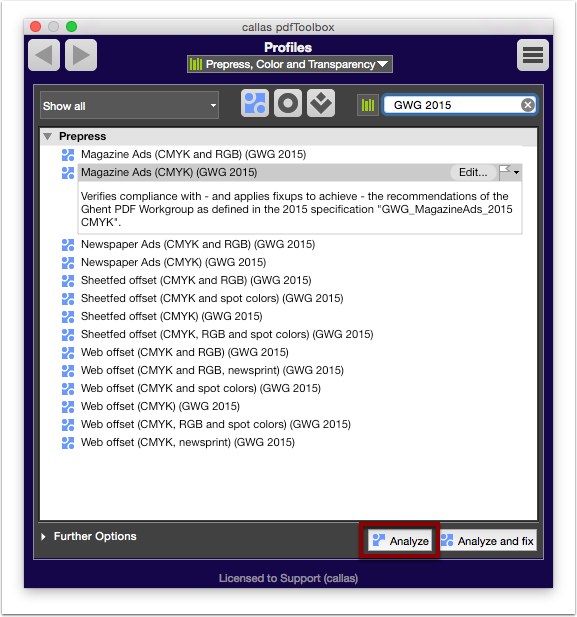 The GWG 2015 profiles were published in January 2016 and are based on the PDF/X-4 standard. CMYK web-fed offset, spot color web-fed offset and newspaper web-fed offset. Specialist GWG 2015 profiles exist for sheet-fed offset, web-fed offset and the categories of newspaper and magazine publications. All profiles are based on the PDF/X-4 standard (ISO 15930-7:2010). 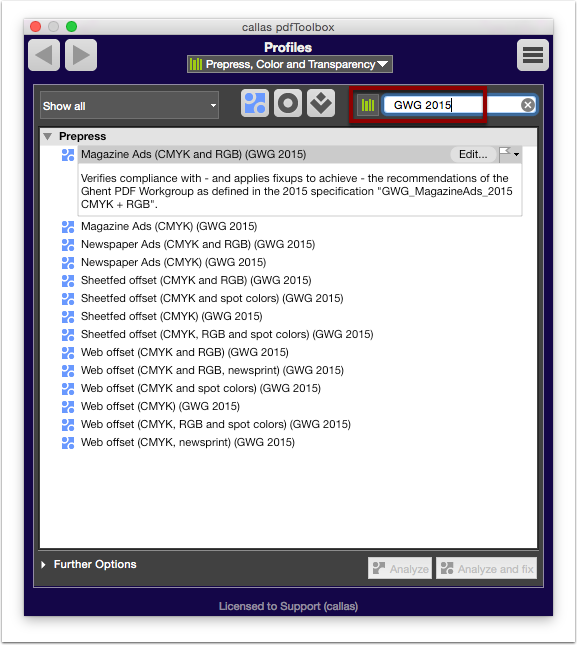 You can test a PDF file’s compliance with the GWG 2015 profiles by opening the Profile window (keyboard shortcut Cmd+3 (Mac OS) or Ctrl+3 (Windows) and select the desired template for the planned print run. Selected and therefore open entries display additional information about each profile. Click Analyze to start the checkup process. 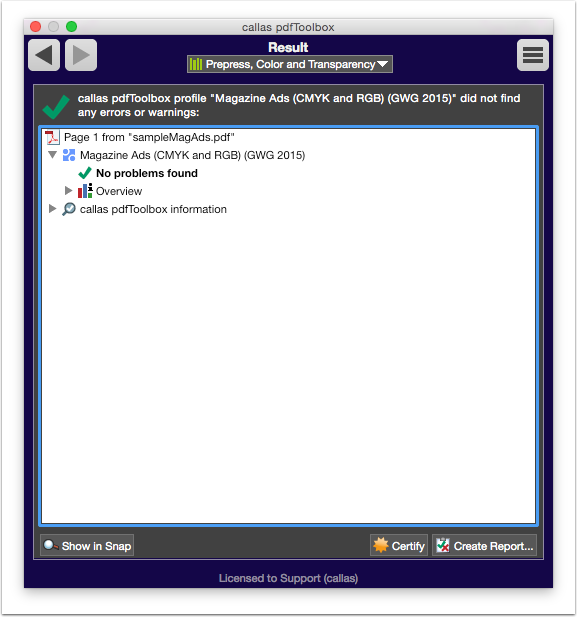 If pdfToolbox finds no problems with the selected GWG 2015 profile, the Result window will show a green check mark. The Result window will also provide the name of the validated PDF file, with options to open the overview and callas pdfToolbox information to show further details about the testing process. ... and/or create a report. If an error is detected, the Result window will show a red X symbol. In the list of errors, the program will identify precisely which problems were detected and will name them. Many problems can be displayed directly by selecting Show in Snap. The result can be output as a report for communication or documentation purposes. 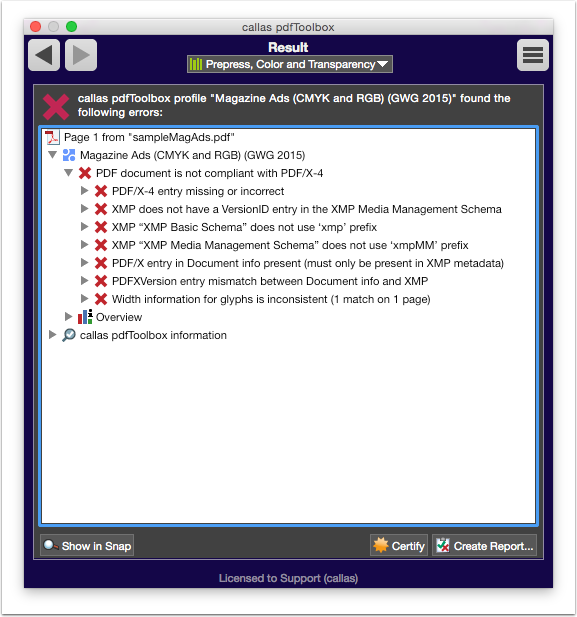 An open PDF document can be analyzed and fixed for GWG 2015 compliance in a single step. Begin processing by clicking Analyze and fix. 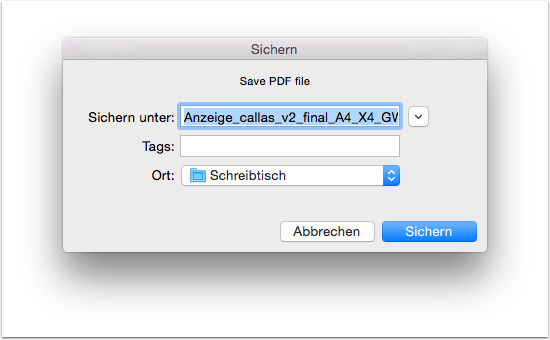 During the Analyze and fix process, pdfToolbox will ask the user to save a copy of the PDF file under a new name. If the Fixup process finishes successfully, a green check mark will be shown. pdfToolbox will also show a list of all Fixups that were applied. Details can also be found in the Overview. Optionally, the PDF document can also be certified. If not all Fixups required for compliance with the selected Profile can be applied, pdfToolbox will report an error: This can be quickly identified with the red X symbol. The Result window provides a precise detailed view of the analyzed and fixed steps. Click Create Report... to save an in-depth evaluation in one of a range of file formats for documentation or communication purposes. The new "GWG 2015"-Profiles are based on PDF/X-4 and replace the old "1v4" Profiles, which date back to the year 2008. If you want to use the old Profiles nonetheless, please feel free to download them here: Download GWG 2008. Please note: These Profiles are from pdfToolbox 8.3 and will not be updated anymore. They can be used with all versions of pdfToolbox since version 8.3.